Stage 1 finished 45 minutes faster than expected by the race organizers. The riders rode the first 100 miles in under 4 hours, including Lizard Head pass which took them approximately 2 hours. 3882 KJ- 55 bananas = approximately 3880 calories, the amount of calories burned by van Garderen during Stage 1. Despite the blistering pace of the entire stage, van Garderen still managed to produce his most explosive effort in the final dash to the line. His Peak Power at the line? 1088 W! Euser hit his 20-minute peak power in the final 20 minutes of the race, riding hard for his eventual top 10 finish. Climbing 800 feet to the top of Mt. 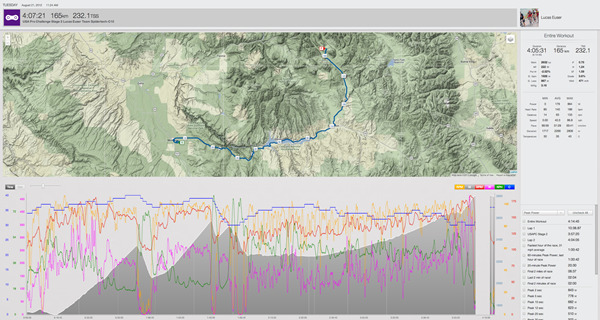 Crested Butte Ski Area, Euser manages to average 26.4 mph in these 20 minutes after 3.5 hours of hard racing! 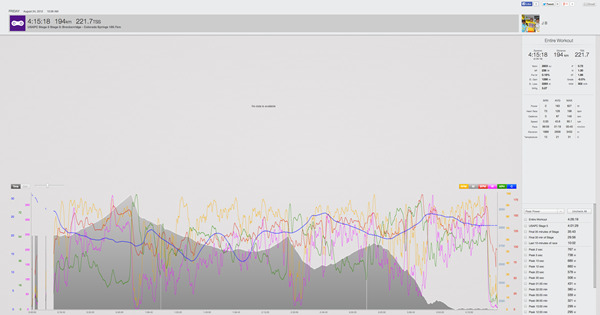 Compare the fastest 60 minutes of the race, when Euser was safely tucked in the peloton, against the last hour of the race, when the pack was getting strung out over the final climb and Euser lost the advantage of drafting in the pack. In the pack, Euser averaged 135W to go 31 mph, spending 490 kJ. On the last hour, he averaged 212W to go 27 mph and spent 771 kJ. Great illustration of the point that a rider can save up to 30%-40% of their energy riding in the draft than off the front of the pack or in a breakaway. Garmin-Sharp takes control on Stage 3! Around the midpoint of the stage, eventual stage winner and all-rounder Tom Danielson emerged in a breakaway with teammate David Zabriskie. With Zabriskie’s help for part of the way, Danielson emerged over the summit of Independence Pass on his own about 2 and a half minutes ahead of the chase group, which contained then-race leader Tejay van Garderen (BMC Racing). Without any teammates left to aid in the chase, van Garderen took the reins and worked hard to bring Danielson back. In the final kilometers the other remaining teams in the lead chase group realized the possibility of victory and took over the chase. Danielson hung on by a mere 2 seconds for the win and teammate Christian Vande Velde took over the race lead. Huge stage today for Jani. 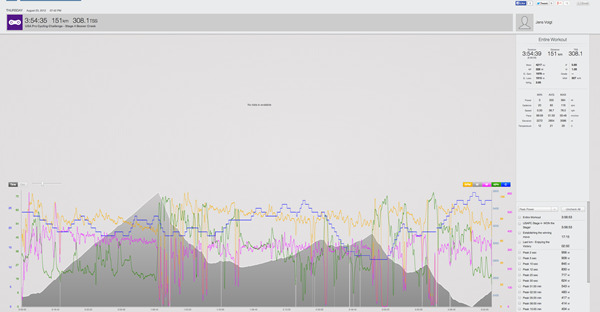 His Peak Power values are all over the map today, occuring on both the massive Cottonwood and Independence Pass climbs as well as Peak 20 second Power of 512W (7.9w/kg) hammering at the finish line to try to catch Danielson with the rest of the chase group! His efforts paid off as he came in 5th only 2 seconds behind Danielson. Jani hits 65 mph (105 kph) on the first descent down Cottonwood Pass! 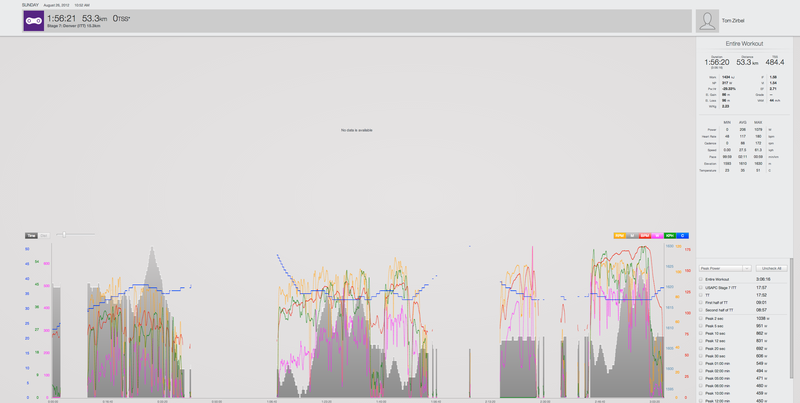 Peak 20-minute Power of 288W occurred at the top 8.2 km of Independence Pass, chasing Danielson who at the time had about a 2 minute lead on the rest of the peloton. Brajkovic now sits in 8th place overall, just 12 seconds behind the overall race leader, Christian Vande Velde. After 3 long, hard days of racing, just 12 seconds separate the top 13 riders. Last year this race was won by 11 seconds! We called it! Our pre-race prediction: “We will most likely see a breakaway on today’s stage where a solo rider may survive on the final slopes up to Beaver Creek…Look for a rider such as Jens Voigt who has a massive engine to go on the attack in search of victory.” That’s exactly what happened today, with legendary “hard man” Jens Voigt escaping with the breakaway at the start, then dropping his 15 break-mates and riding alone off the front for more than 3.5 hours. By the time he hit Minturn with 5 miles to go to the finish, he had a 6 minute advantage on the peloton, and everyone knew the race was won. Strong and Steady wins the race! Averaging 300W (3.9 w/kg) for the 4-hour stage and spending 3.5 hours of it off the front alone, Voigt also kept the speed steady averaging 24 mph (38.7 kph). The “Hard Man” keeps a cool head: Jens’ max speed today may be surprising to some – he only topped out at 48.7 mph (78.5) on his descents. Most riders hit 60+ mph in a race. This shows his experience and patience – why risk going down when you have a lead? He kept it safe on the descents, knowing there was no need to hang it out completely, and he drilled it on the climbs (Peak 1-hour Power of 367W was climbing Independence Pass). A younger rider may have taken more risks and crashed, but Jens, with 17 years of professional experience and 88 wins under his belt, trusted his pacing. It’s very hard not to panic when you are off the front alone. This is the cool-headed move of a true veteran. Jens burned 4200 calories during today’s epic effort, the equivalent of 26 New Belgium Fat Tire Beers! He earned himself an extra 6-pack for riding solo for most of the stage – he would’ve saved approximately 30% more energy had he been tucked away in the peloton. Savoring the victory: With a 6-min lead on the peloton by the end, Voigt sits up and enjoys the last kilometer in, cruising into the finish at 13.6 mph (22 kph). Race broadcasters estimate he would’ve been going 2x as fast if he didn’t have his massive lead. We called it again! Our pre-race prediction: “Today’s relatively flat stage into Colorado Springs is the best chance to see the sprinter specialists make their mark…The sprinters have likely been eyeing this stage for months, and a rider like Tyler Farrar might be a safe bet to cross the line ahead of the rest.” Farrar indeed sprinted to his second stage win of the race today. Fighting to stay with the lead group in the final 30 minutes of the stage and maintain 5th overall in the race, Brajokovic’s SRM power meter shows at least 36 bursts over 400W (6.2 w/kg), 9 of which were over 600W (9.2 w/kg)! In the last 10 minutes of race, Brajkovic averaged 32.7 mph (52.7 kph) and topped out at 44.6 mph (71.1 kph) while navigating the 5 corner finishing circuits in a pack of 68 riders! Jani’s average heart rate of 129 bpm for the entire 4-hour stage would be within the range of heart rates associated with “moderate intensity walking” (up to 134 bpm) for an average 29-year old male. Except, with that heart rate Jani covered 118 miles on his bike at an average speed of 29.3 mph. A win for the “home team” as Boulder’s Rory Sutherland (UnitedHealthcare Pro Cycling Team) steals the show as Leipheimer moves into yellow. Rory Sutherland gave UHC Pro Cycling their first stage victory of the USAPC by riding away from the remnants of the early race breakaway and crossing the line solo. As has been the case for every stage so far, the attacks started immediately once the racing was under way and a break of 14 riders escaped containing the ever feisty Jens Voigt (RadioShack Nissan Trek) , hometown favorites Timothy Duggan (Liquigas-Cannondale) and Rory Sutherland (UnitedHealthcare Pro Cycling Team), and 10 others. As the break began the ascent of Flagstaff, the final climb of the day, the main field had whittled the gap down to 2 minutes. But then Sutherland launched the winning attack from the break – and was gone. Gunning for the win: Sutherland hit his 60 min Peak power in last hour of the race at 366W (4.7 w/kg), his 30-minute Peak Power of 381W (4.9 w/kg) racing up Lefthand and Lee Hill, and then lit the dynamite for the final summit up Flagstaff with his 20-minute Peak Power for the day of 438W (5.6 w/kg). 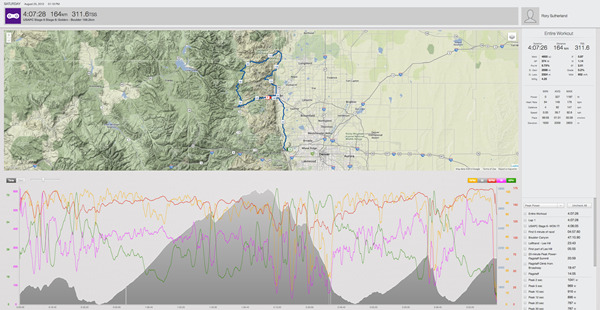 Rory completed the iconic Flagstaff Mountain climb in 14:05, averaging 462W and 22.8 mph during the effort. Stronger than a horse: Sutherland was alert from the gun, determined to make the early break. He puts in 6 efforts close to 800 W or more and 11 over 600W in the first several minutes of the stage. Even after the 14-man break was established, Sutherland and his breakaway-mates had to drill it towards Boulder to establish their lead. This is when Sutherland performed his 30-sec Peak Power of the day of 787W (10.1 w/kg) – more power than a draft horse can put out at 750W! 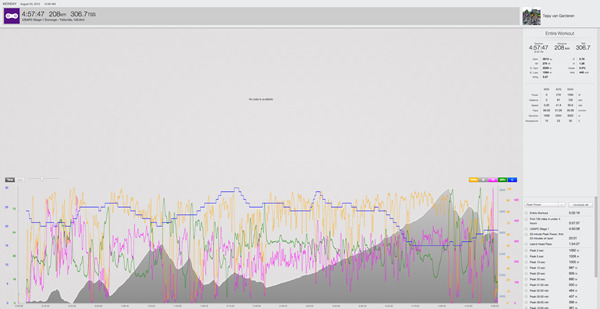 In fact, Rory exceeded 750W several times today including on his climb up Flagstaff. The winning move: with the breakaway group about 2 minutes ahead of the peloton, Jens Voigt launched a solo attack at the base of Flagstaff. Rory knew he couldn’t let Voigt go if he wanted the win – with approximately 5km remaining on the climb, Sutherland bridged to and immediately passed Voigt for the race lead. Rory’s surge included a staggering 10 second effort of 916W (11.7 w/kg) and a peak of 1049W – but it turned out to be the move that won the race. From that point on, attempts to catch Rory were futile. A 10K in 12 minutes! Zirbel’s 12-minute Peak Power of 450W (5.1 w/kg) covered 6.2 miles exactly, or the length of a 10K fun run averaging 31 mph. The world 10K track record for men is held by Kenenisa Bekele of Ethiopia in 26:17.53, posted in Brussels, Belgium on August 26, 2005. Zirbel’s pacing: For time trial specialists such as Zirbel, it is imperative to have a pacing strategy. Some riders prefer to hold back at the beginning to make sure they have enough gas to finish strong. 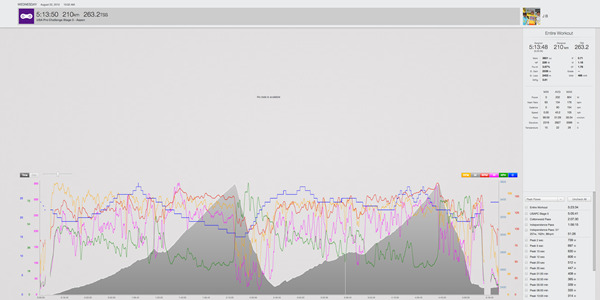 Zirbel opted to go out a little harder in the first half of the flat TT, setting his 5-minute Peak Power of 471 W and averaging 457 watts in the first 9 minutes. For the last half of the time trial he averaged 437 W for the last 9 minutes. This pacing worked out well for Zirbel as he finished 6th on the stage. Several very sharp turns on the first half of this highly technical course. The first one, which caused a few crashes today, is more than 90 degrees at 0.7 miles, followed by 2 quick 90-degree turns at 1.5 miles, then another 3 immediate 90 degree turns at 2.8 miles. Zirbel had to skillfully balance caution and speed on these turns, dropping down from 38 mph to 27 mph for the first turn, and as low as 16 mph on the third set of turns that essentially formed a fast “U” on the course. After each turn, Zirbel hammered it to get his speed back up, spiking up to 975W on one effort.